The annual hate crime figures released on Tuesday revealed another dismal increase in recorded incidents: a 17 per cent annual increase to 94,098 in total incidents 2017-2018 and what the BBC called a 40 per cent “surge” in religion linked incidents from 5,949 to 8,336. Every act of incivility based on prejudice against a group is a small blow to a civilised society but it is important to point out that the figures just published do not signify an actual increase in incidents of hate. Overall, the story is, in fact, a good one: reports are rising, because there is much more encouragement to do so and the police take it far more seriously than they used to, but actual numbers are almost certainly falling. And we now have new evidence to suggest that, contrary to the widely held assumption, the Brexit blip in reported hate crime after the referendum did not lead to any more lasting increase in bigotry. The graph below shows the historical trend in recorded hate crimes. In 2012/13, there were just 42,255 hate crimes overall so the number has more than doubled since then. Breaking down this year’s figure of 94,098 by protected group category, easily the largest remains race, 71,251, with religion accounting for 8,336. A further 11,636 were related to sexuality with disability accounting for 7,226 and transgender 1,651. 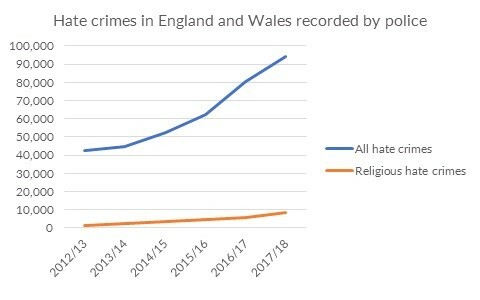 But, and it is a very big but, that story of rising recorded hate crime must be placed in the context of our other source of evidence for hateful acts, the Crime Survey of England and Wales. This tells a very different story that was barely mentioned in the media reporting of the hate crime figures. The Crime Survey, based on a very large survey of individuals, is an important data source as not all crimes get reported to the police. 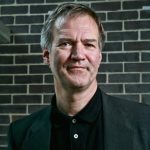 It provides an estimate of all crimes, independent of public willingness to report, and is therefore considered to be the gold standard in crime statistics. 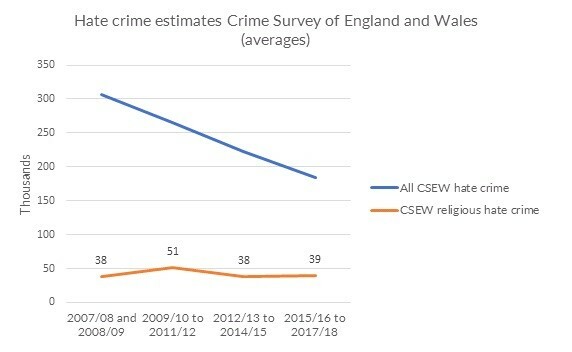 Crime Survey numbers on hate crime are released every three years and are presented as three-year averages in order to ensure a large enough sample. The figures show that in 2015/16 to 2017/18 there was an average of 184,000 hate crimes across all strands each year. That is down from an average of 307,000 each year between 2007/8 and 2008/9. Religious amount to 39,000 each year and this has budged little since the 2000s, as seen in the graph below. So the number of hate incidents has been falling sharply according to this more reliable indicator, albeit from a higher base. (Though Policy Exchange research suggests there may be some reason to doubt the scale of those Crime Survey numbers.) The smallest decline has been in the area of religious intolerance but even here the numbers are broadly flat, so hardly a “surge” in actual religious bigotry. All those, including the Government itself (see the green paper on Integrated Communities), who have sought to portray the country as less tolerant in the aftermath of the EU referendum would do well to take stock. It is also worth noting that there has been no marked increase in the number of successful prosecutions for hate crime incidents which have remained around the 12,000 mark for several years and actually fell slightly last year. And, thankfully, most incidents remain non-violent. Every 7 out of 10 recorded hate crimes were to offences relating to ‘stalking and harassment’ or public order offences, the vast majority shouted abuse. Just 7,639 were violent and resulting in injury. These numbers come on the back of the Government’s “refreshed” hate crime plan, amounting to new measures to tackle the problem. The most eye-catching announcement is a new review by the Law Commission into hate crime, to see if legislation could be made more effective and if the definition should be expanded to include misogyny and misandry (prejudice against men), age, as well as subcultures such as goths. Also announced was an extension of public funding for security measures for religious sites of worship, more training for police, a revamping of the True Vision reporting website (an online reporting mechanism), and £1.5 million for civil society groups including the Anne Frank Trust and Kick It Out. There will also be ministerial round tables on anti-Semitism and bigotry directed at Muslims. All this is welcome but there is a danger that further extensions to the definition of hate crime risks undermining how seriously the whole issue is taken. Furthermore, the Government needs to make clear how these funded groups are going to spend the money and by what standards they will be judged to be effective or successful.